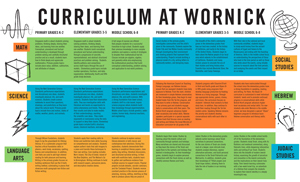 The Wornick curriculum has been designed to promote intellectual growth, social-emotional well-being and creativity. Critical thinking, discovery learning, a questioning stance and a growth mindset are the foundations of intellectual growth in every grade. Children learn by exploring, discovering and creating. We support social-emotional development by teaching conflict resolution, communication skills and applied Jewish values. Our program’s focus is on the care of self and others and a modeling of desired behaviors in all of our interactions. 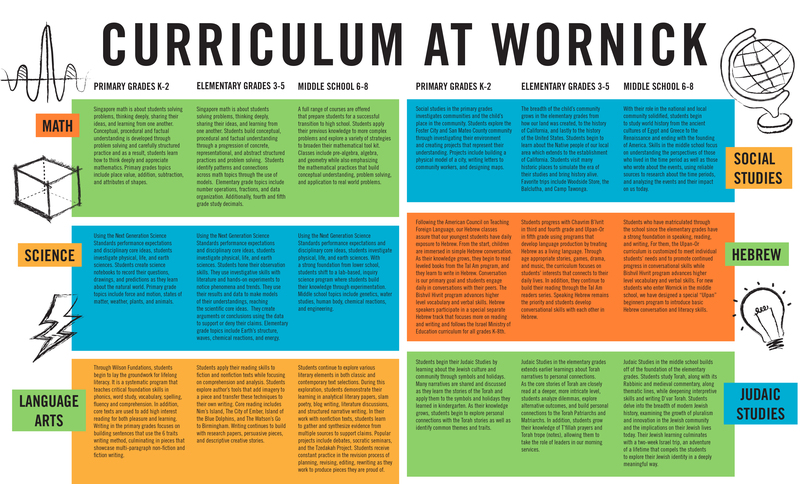 The curriculum values creativity as well--from developing a piece of fiction or creating visual art, to the more transformative creativity of finding a new solution for a persistent problem. Our literacy program is based on Common Core Standards. The focus is on reading carefully to determine what is explicit and what is inferred in texts, how an argument is developed, and how to analyze and contrast multiple texts with competing arguments. Even before our kindergarten students are fully able to read, they are taught how to find evidence to support claims in the stories that they hear. From kindergarten through eighth grade there is increased complexity of literacy learning. Similarly, the writing program promotes writing coherent pieces that demonstrate effective selection, organization and analysis of content. Teachers curate materials from many sources to provide students with multiple opportunities to develop strong literacy skills. The mathematics program, following Common Core Standards, places a premium on mathematical understanding. This is the ability to justify why a particular mathematical statement is true, or to understand the development of a mathematical proposition. We begin this journey with solidifying student’s understanding of numbers as symbolic representations of quantities. From the start, children are introduced to all operations – addition, subtraction, multiplication and division – as they are invited to see how these operations are methods for bringing items together or taking them apart. Singapore Mathematics methods inform much of our mathematics teaching in early elementary grades. As students move into middle school, they follow a typical sequence of pre-algebra and algebra. An accelerated program enables some students to complete geometry in eighth grade. The TK-8 science program is structured according to the recently created Next Generation Science Standards, which focus on scientific process and a critical understanding of scientific inquiry. From transitional kindergarten through eighth grade, students learn with increasing complexity physical, biological, earth and engineering science concepts. Because of the focus on process, students spend significant time discovering and uncovering concepts through observation and experimentation. They learn to revise and refine their concepts from each discovery in every process. Because science asks and answers questions about the physical world about which children have a natural curisity, students are frequently cued throughout the day to notice or to observe the various scientific phenomenon that they encounter. The Wornick social studies curricula begins by introducing children to their place in a community then to a past and future timeline. 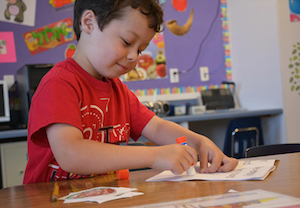 As students move through the various developmental stages, their understanding of time and place and their connection to these two concepts grows. Throughout this program, children learn different perspectives about land, governance, commerce, religion and peoplehood. Ultimately, students build their personal identities by understanding their relationship to the past and the present and to place. Our graduates are prepared to make informed and reasoned decisions for the public good as citizens of a culturally diverse, democratic society in an interdependent world. 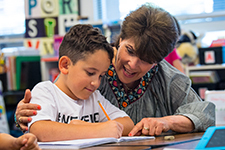 Hebrew occupies a central role in the curriculum, transmitting Jewish culture, strengthening American Jews’ connection to Israel, and connecting Jewish children with their religious heritage and textual tradition. Our school is leading the way in understanding Hebrew language instruction as serious second language learning, providing our students with the cognitive benefits of learning such a difficult language and the opportunity to learn an increasingly valuable language to the dynamic Silicon Valley. Wornick offers both a native and non-native track. Following best practices as set forth by the American Council on the Teaching Foreign Languages, Wornick emphasizes communication skills for non-native speakers, supporting our students to become conversationally proficient by the time they graduate. For native speakers, our Hebrew curriculum follows Israel’s Ministry of Education standards. The Judaic Studies program provides another opportunity to teach critical thinking skills, to emphasize the literacy standards of Common Core and to reinforce social studies skills while also connecting students to a vibrant tradition that values celebration, commemoration and opportunities to express wonder and awe. The program includes text study (Torah, prayer and commentaries), social studies (history, Israel – past and present, culture) and values. There is a particular emphasis on the values of tikun olam (repairing the world), chesed (treating everyone with kindness) and tzedakah (giving to others). Our school also partners with HaReali – an independent school in Haifa, Israel. Throughout their years at Wornick, students have opportunities to connect to peers at the Reali school. In eighth grade, the Reali students visit our school in the fall and our 8th graders travel to Israel to meet their friends there in March. The middle school maintains a one-to-one laptop program. Younger children work on iPads, Chromebooks and MacBooks that are available throughout the day. Using Wornick Health and Wellness curricula, we promote a love of physical activity and lifelong wellness. The Wornick physical education program is based on goals and objectives that are designed to meet the physical and emotional needs of each student by including a balance of athletics, health, science, teamwork, and skill concepts, all designed to assist each student in making better fitness and wellness choices. Art is part of the TK-5 curricula with an emphasis both on art appreciation and technique. All elementary school students have a minimum of one period of art a week with an art specialist with projects linked to other curricular units beyond the weekly period. Arts electives are available in middle school and vary year to year, but can include: Making Change Through Art, Drama, Musical Theatre, and Yearbook. Music education at Wornick is integrated into the curriculum beginning in TK/Kindergarten and continues through the eighth grade. This year, First, Second, and Third Graders study musical theater while Fourth and Fifth Grade Wornick students study percussion. Singing, music appreciation, and performance art are also woven into the Judaic Studies and Hebrew curriculum. These many opportunities build confidence, strengthen students’ musical understanding and provide an outlet for creativity and expression.